Most people have heard of Stonehenge and Avebury and some may be able to name a few other stone circles, however there are very many more, nearly a thousand survive, while many have been lost. There are still many more undiscovered or undocumented, and some new ones being created. No one today knows what they were all for, or what they all are, you will see many theories, including calendars and planetary predictors, energy control systems and witchcraft, with the old fall back of ceremonial use being dropped in where we don't really have a clue. We decided to cover this in some depth, and we have location guides and articles. 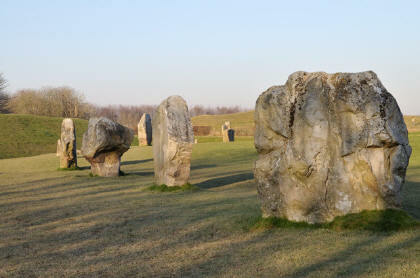 Stone circles of Britain, is an introductory article looking at what they are, what they may have been used for and covers a range of theories without settling on any one. This is a good place to start. 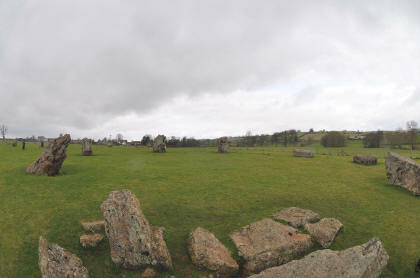 Stone circle photography, looks at what is involved in photographing a stone circle and how to go about it. Preparing for a photographic trip to a stone circle, looks at what information you can find out before you go, links to a range of useful resources and other items that you can do in advance, as well as a what to take with you. A selection of stone circles, lists some of the stone circles in England, Scotland and Wales that a variety of people have recommended, and gives the county, nearest place and a grid reference. Sites we have featured are linked from this page. 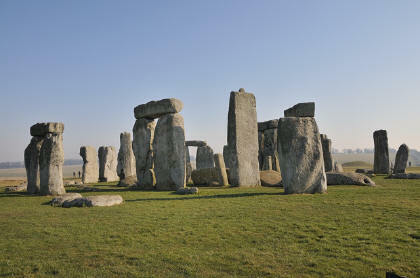 All known stone circles - in alphabetic order (large file). All Known stone circles - sorted by grid reference (large file). See the featured list below. Stonehenge - Wiltshire world famous and unique, very much on the tourist trail. Avebury - Wiltshire the largest and most spectacular, popular with tourists, but less restrictions and being such a large site, you don't notice the numbers. Stanton Drew - Somerset second largest after Avebury, not visited by many, you are likely to be on your own when visiting, far more natural and not reconstructed. 3 circles including very large circle, and one with very large stones, an avenue, another feature with large stones, a small circle and another group of stones conveniently situated in the garden of a pub nearby. The main circle has its own magnetic field. This site is easy to get to, but you will find you spend a lot longer here then you expect to. Rollright - Oxfordshire interesting nearly complete ring of stones weathers into interesting shapes. Two other nearly groups of stones. CairnHoly, Dumfries, Scotland The remains of a long borrow with standing stones that at first sight look as if it could have been a stone circle.